GMR Infrastructure Ltd has won India’s largest single road project awarded by the National Highways Authority of India. The ₹ 7,000 crore order (according to GMR estimates) catapults the firm into big-league road projects. More importantly, being a brownfield job involving six-lane conversion of the existing Kishangarh-Ahmedabad highway, it would add to revenue immediately. Estimates are that it would boost revenue by about ₹ 660 crore from fiscal 2013 (FY13). Of course, the big concern for infrastructure firms at this juncture is securing bank funding to finance the debt component (up to 75% of project size). Thankfully, the initial equity investment of about ₹ 350 crore, required to be infused by GMR during the current fiscal, is not an issue, given that it has a strong balance sheet with around ₹ 4,000 crore of cash and liquid investments. An Emkay Global Financial Services report also estimates cash flows of about ₹ 3,600 crore between FY12 and FY13. Clearly, GMR’s financial health is more stable than it was a few quarters ago. But, with more funds required over the next 12-18 months, analysts expect the debt-to-equity ratio to inch up to around 2.5 by FY13. The way out to cover higher interest costs and debt repayment is strong revenue generation. For now, the airports segment is the biggest contributor to revenue. With a majority stake in two premium airports—Hyderabad and Delhi—where the investment phase is behind the firm, profits hinge on passenger traffic growth and expected tariff revision. In fact, higher depreciation and interest costs during the June quarter was a dampener, pulling operating margin for the airports segment down from 37% to 29%. However, in the next 24 months, the power segment would be the largest contributor to revenue and profit. Analysts expect its integrated coal-based power projects would lead profit growth. For now, the segment is plagued by gas availability and non-remunerative power tariffs. 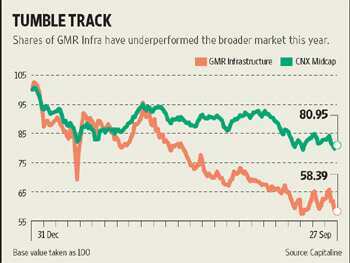 One could think that GMR’s improved business focus, given the stake sale in its Singapore power asset and in the Netherlands joint venture, is reassuring to investors, as the cash generated would be used for future projects and to deleverage its balance sheet. Given the complexity in funding big projects and the long haul to profitability, there is little investor interest in the stock, which closed marginally lower on Tuesday.